Healthy food and other issues related to health have been a major concern among population since ages. The world is moving towards trying out different health food options. You serve different health foods at your place. So advertise them and make people on-the-go with health food neon signs. 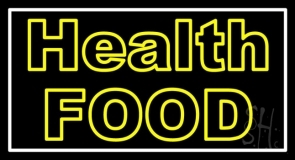 Health food neon signs go well displayed in the window, at the door or even at the walls of your caf�, store or any restaurant. With the radiant glow, customers will be able to notice your health food neon sign even from far distances. Health food neon signs are sure to shine for years keeping on all day long even in the extremes of weather conditions. We have a wide range of health food neon signs and vitamins health food neon signs. 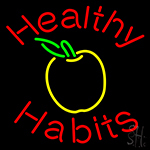 Select a neon health food sign from our collection and add a spot on effect to your business. 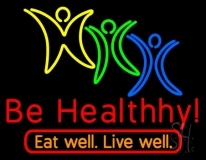 Motivate your existing and potential customers to opt for your health food servings with Be Healthy Eat Well Live Well Neon Sign from our assortment. We also customize health food neon signs for your business requirements. 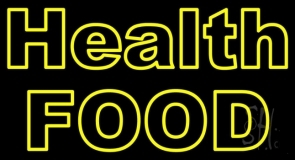 Choose to add uniqueness to your restaurant or store by getting your health food neon sign customized. With your imaginative ideas, business logo and name, our designers will create an exquisite health food neon sign that will best fit all your requirements. So draw your customers into your restaurants to order your healthy feast again and again with customized neon health food signs. Contact us for custom and design health food neon sign today!